How is the lap band (LAGB) procedure performed? How long is the recovery after lap band surgery? What is a lap band fill? What can I expect my lifestyle to be after lap band surgery (LAGB)? What are the side effects of lap band surgery (LAGB)? What are the risks and complications of lap band surgery (LAGB)? What type of surgeon performs lap band surgery (LAGB)? Obesity is a growing concern. By medical standards, obesity is defined as having a body mass index (BMI) of over 30 kg/m2. While lifestyle modification remains the cornerstone for treatment, surgical options are becoming more popular. One of the surgical treatments for obesity is called gastric banding, commonly known as lap-band surgery. Some of the specifics of gastric banding will be addressed in this article. Laparoscopic adjustable gastric banding (LAGB) is a surgical procedure that involves the placement of an adjustable belt around the upper portion of the stomach using a laparascope. The band is made of silicone and can be tightened by adding saline to fill the band (like blowing air into a doughnut-shaped balloon). The band is connected to a port that is placed under the skin of the abdomen. This port is used to introduce or remove saline into the band. Generally, candidates for LAGB have a body mass index over 40 kg/m2, or are more than 45 kilograms over their ideal body weight. LAGB can be performed on a person with a BMI of 35-40 kg/m2 if there are problematic medical conditions that are weight-related, such as high blood pressure (hypertension) or diabetes. While there is growing discussion about offering LAGB to those with a BMI of 30-35 who have diabetes, there are no current guidelines for this. Lap band or LAGB is a surgical procedure done under full general anesthesia and takes about 1 to 2 hours to perform. It is done using a laparoscopic technique. This involves making 3 to 5 small incisions, each about 1 inch in length. The surgeon inserts a small camera attached to a tube into one of these incisions and views the procedure on a screen. The other incisions allow for the use of surgical instruments and placement of the band. The gastric band is placed around the upper part of the stomach and set into position with sutures. The port is then placed in the wall of the abdomen and sutured in place. Depending on the surgeon or the program, the preparation for surgery will vary. Many centers like to see a commitment from the patient to the necessary lifestyle changes even before surgery. It may be suggested that the patient start eating 5 to 6 small meals a day to prepare for the changes ahead. It may be recommended to wean off "slippery" high calorie foods such as ice cream or milk shakes (since these will continue to be easily absorbed after the procedure). If the BMI is greater than 50, or if there are other medical issues, medical risk reduction may be needed preoperatively and should be discussed in detail. In addition, a weight loss of 5% to 10% prior to surgery has been shown to improved post operative outcomes, and may be a goal that your surgeon or preoperative care team will discuss with you. Recovery varies with each individual. However, in general, LAGB offers a shorter hospitalization and quicker recovery than gastric bypass procedures. In general, most people can return to work 1 week after surgery (if their job is not too physically demanding). Normal activity can usually resume after 6 weeks. 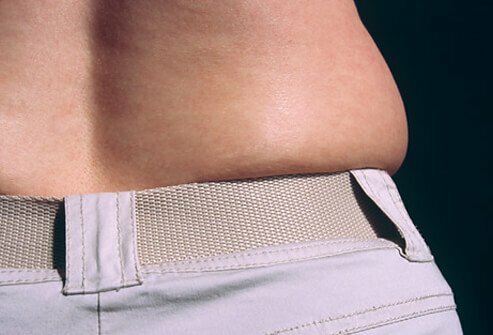 A lap band "fill" is the common term for gastric band adjustments. Once surgery is performed, there is a period of healing that must take place before the first adjustment. Usually, the first fill takes place around 6 to 8 weeks. It involves injecting saline into the port just under the skin which is connected to the band. Prior to this, there may be little change in appetite. Fills are painless and are usually performed by the surgeon who performed the procedure. These adjustments may take place to enhance weight loss, especially if there is a plateau phase in weight loss, and they may to performed to overcome side effects such as nausea and vomiting (in this latter case, the band is loosened). Immediately after surgery, there will be some pain and discomfort that can be controlled with medications. This is part of the normal recovery phase after any surgical procedure. After 6 to 8 weeks, one can generally return to normal activities. Weight loss with LAGB is a gradual process. Initially, the weight loss may be more dramatic- say 2 to 3 pounds per week. However, this generally slows to a pound or so weekly over the long-term. Naturally, the food choices made will govern this weight loss rate. After about 18 months, the weight loss tends to slow significantly. The average weight loss for this procedure is 40% of excess body weight in the first year, with an additional 10% to 20% in the second year. Patients are usually asked to keep in contact with their surgeon regularly during this time period as further band adjustments may be needed. Side effects include nausea and vomiting, ulceration at the band site, esophageal reflux (indigestion), weight regain, and dehydration. Since this type of surgery is restrictive and does not cause malabsorption of nutrients, vitamin deficiencies are not usually seen. However, many centers recommend multivitamin supplementation. Constipation is commonly encountered. LAGB has a low risk of surgical complications compared to other weight reduction procedures. The mortality (death) rate is about 1 in 2000. There is the possibility of the band slipping or eroding into the stomach and of mechanical malfunction. Other complications may include infection, bleeding, and/or abdominal pain. When choosing a surgeon, it is important to search for one who is a qualified bariatric surgeon. In general, practice makes perfect, and the more surgeries performed the better. A surgeon performing 100 or more procedures annually is likely going to have better outcomes. A surgeon who is part of a clinical team of nutritionists, nurses, psychologists, and physicians in general can provide better counseling and support in the pre- and postoperative period. Dixon JB., O'Brien PE. Changes in comorbidities and improvements in quality of life after LAP-BAND placement. The American Journal of Surgery, December 2002; Vol 184: pp S51-S54. Favretti F., Ashton D., Busetto L., Segato G., De Luca M. The Gastric Band: First-Choice Procedure for Obesity Surgery. World Journal of Surgery, October 2009; Vol 33(10): pp 2039-48. Ren CJ., Horgan S., Ponce J. US experience with the LAP-BAND system. The American Journal of Surgery. December 2002; 184(6B): pp 46S-50S. Gastric bypass surgery is a procedure that creates a small stomach pouch to restrict food intake and constructs bypasses of the duodenum and parts of the small intestine to decrease one's ability to absorb nutrients from food. There are two types of gastric bypass operations: Roux-en-Y and extensive gastric bypass. Patients who undergo gastric bypass surgery will need to take nutrition supplements due to limited absorption of certain vitamins and minerals. Prenatal vitamins have iron, calcium and vitamin D, folic acid (to prevent birth defects), zinc, iodine, and vitamin A. Some prenatal multivitamins also contain other minerals and supplements like vitamin B 12 and omega-3 fatty acids. Talk with your doctor, OB/GYN, midwife, or other health-care professional about taking prenatal vitamins. REFERENCE: USDA. "Why Take a Prenatal Supplement?" Updated: Jul 02, 2015.